SEMCO has been family owned and operated for 4 generations providing a variety of custom molded plastic products to a wide spectrum of industries. 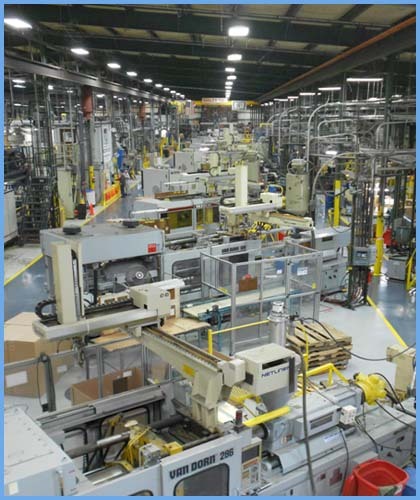 SEMCO offers its customers an array of capabilities related to custom molding. Our 450,000 sq. ft. facility, centrally located in the Heartland of the U.S., St. Louis, MO, allows for product design and development, tooling, production, customized graphics, packaging, and centralized shipping all under one roof for our custom molded plastic products. SEMCO’s operations are managed by an innovative software system, IQMS, which is designed specifically for plastic manufacturing. This system allows us to offer customers Just-In-Time (JIT) shipping, Vendor Managed Inventory (VMI), Electronic Data Interface (EDI), In-House PPAP Process and Robotic Automation Cost Reduction Programs (RACRP). Using state-of-the-art new presses, quality control testing equipment, and Wireless Real-Time Production Monitoring, we stay competitive in overall value for our customers.